Indiana State University's Cunningham Memorial Library has added another rare volume to its esteemed Warren N. and Suzanne B. Cordell Collection of Dictionaries in honor of the institution's 150th celebration and to recognize the four decades since the third gift by the collection's namesake. An unpublished manuscript written circa 1730 in English and Telugu, "Gentou & English Grammar" is attributed to Benjamin Schultze, an early German Lutheran missionary to India. The small, 294 red-ruled pages are neatly written in ink, uncut and bound in the late 18th century polished calf with gilt rules on covers, gilt-decorated spine in six compartments and an engraved North Library bookplate on the front pastedown. A non-descriptive cover with minor wear on the edges, the inside of the text is in nearly mint condition and includes a 22-page appendix with the Apostles' Creed, The Lord's Prayer and the first chapter of Genesis in Gentoo and English. "I told the bookseller, who was instrumental in the purchase of this manuscript, that I wanted something new and different," said Cinda May, associate librarian and chair of special collections at Cunningham Memorial Library. "When he offered this unpublished manuscript I knew this is what I was looking for. It suits contemporary research interests and is unique and special in its own right, likely surviving because it was in a library collection and someone bound it." The grammar is just one of the pieces that will be on display for 45 attendees of the International Conference on the Historical Lexicography and Lexicology at Indiana University on July 14. May said the group will have more than an hour of open access to Indiana State's Cordell Collection, where they can personally examine rare and important works related to their interests. At a luncheon for the attendees, the manuscript will be presented to Indiana State's President Dan Bradley as a gift for the institution's sesquicentennial and in recognition of the 40th anniversary of Warren Cordell's third gift to the university's Cordell Collection, which houses nearly 30,000 rare dictionaries, grammars and word books dating back to 1482, including several hundred volumes from the Merriam-Webster Company as well as almost 500 volumes purchased with a National Endowment for the Humanities grant. The library continues to buy dictionaries and related materials each year to add to the collection. The latest addition to the collection, "Gentou & English Grammar" includes a 10-page preface with hints about the circumstances around how the work was composed, as well as clues to its authorship, including references to Schultze's removal to Madras and the establishment of a school. The handwriting also matches at least six other Schultze manuscripts at the Franckesche Stiftungen in Halle, Germany. The grammar is laid out in eight chapters and details the Gentoo alphabet, structure and variation of the letters, reading and pronunciation. A 17-page Gentoo-English word list in triple column also gives pronunciations, declensions, numerals and numbering, in addition to a section on nouns, adjectives, adverbs, verbs, participles, moods and tenses, particles and syntax, offering a contrast to modern grammar in the English market, where the work never reached. "I'm excited to have this manuscript because it speaks to a growing field of interest in missionaries as lexicographers," May said. "It's a brilliant piece of work." Individuals interested in seeing the "Gentou and English Grammar" are invited to visit Cunningham Memorial Library's Special Collections Department. The Reading Room is located on the third floor of the Library and is open to the public Monday through Friday from 9 a.m.-5 p.m.
https://photos.smugmug.com/Other/Media-Services/Media-Cunninham-Memorial-Libra/Cordell-Collection-2016/i-zzPVbQN/0/S/June%2014%2C%202016%20Cordell%20Collection%206079-S.jpg – An unpublished manuscript written circa 1730 in English and Telugu, “Gentou & English Grammar” is attributed to Benjamin Schultze, an early German Lutheran missionary to India. 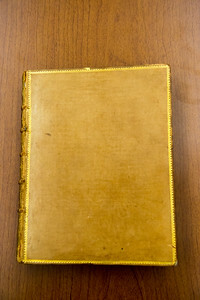 The manuscript, purchased in honor of Indiana State University’s 150th celebration and to recognize the four decades since the third gift by Warren Cordell, the collection’s namesake, will be presented to President Dan Bradley on July 14.
https://photos.smugmug.com/Other/Media-Services/Media-Cunninham-Memorial-Libra/Cordell-Collection-2016/i-52kLWRR/0/XL/June%2014%2C%202016%20Cordell%20Collection%206050-XL.jpg – “Gentou & English Grammar,” the latest addition to Cunningham Memorial Library’s Warren N. and Suzanne B. Cordell Collection of Dictionaries, includes a 10-page preface that offers hints about the circumstances around how the work was composed, as well as clues to its supposed author, German Lutheran missionary to India, Benjamin Schultze. 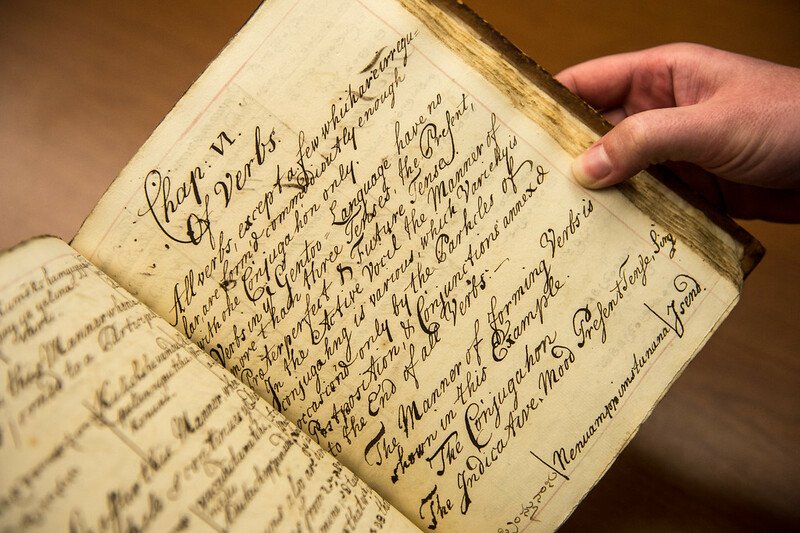 The manuscript, purchased in honor of Indiana State University’s 150th celebration and to recognize the four decades since the third gift by the collection’s namesake, will be presented to President Dan Bradley on July 14. Cunningham Memorial Library has added the unpublished manuscript, "Gentou & English Grammar," to the Warren N. and Suzanne B. Cordell Collection of Dictionaries.